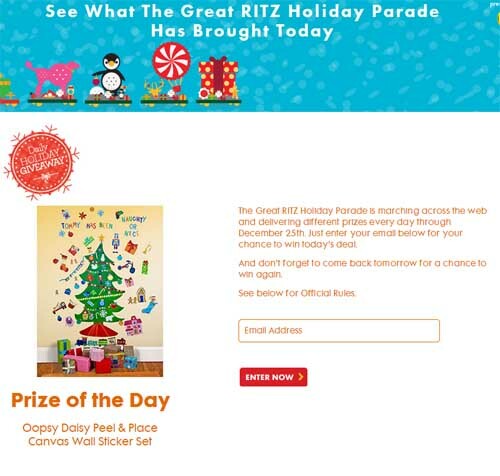 Enter the Great RITZ Holiday Parade sweepstakes for your chance to win amazing daily prizes through December 25th, 2013. You could win one of hundreds of amazing holiday giveaway prizes. The Great RITZ Holiday Parade giveaway is brightening up the web this year and delivery a merry to many! The Christmas sweepstakes could see you winning one of many amazing daily prizes. Visit the website daily to enter and see what prize is up for grabs, I love daily sweepstakes 🙂 To enter simply follow the link below and enter your email below for your chance to win today’s prize. Keeping visiting daily to increase your odds of winning! Here is a list of the upcoming prizes(lots of each item will be given away! ): “An Espressione Red Café Retro Espresso Machine $250, A CB2 Notch Wood Cheese Server and A Box of RITZ Crackers $29.95, A Jane Iredale PureMoist Lipstick $25,An Unlocked Windows Phone 8X by HTC 16 GB $249.00, See Jane Work Ogami Hardcover Notebook $24, Sultra the Seductress- Curl, Wave & Straight One-Inch Iron $210, An Ovo Lamp with Color Finial $149.98, An Avon mark. Coconut Treat Bath and Body Trio $18, Skullcandy Smokin Buds 2 Earbuds $29.99, A Microsoft Surface RT $328.95, A Global Views Peacock Feather Pillow $248, A Pair of Stella & Bow Lily Silver Earrings $38.50, A Striped Seno Pouf Ottoman $289, A Pottery Barn Cozy Cable Knit Throw $129, A Jacki Easlick Black Leather Expanding Satchel with Zippers $395, A Pair of Stance Blondie Socks $24, A CB2 Wine Rack $39.95, A Pair of Lazypants Herringbone Skinnies Sweatpants $138, Project Gravitas Simone Shapewear Dress $295, An EJH Brand Wild Rose Candle $52, A Pair of Brinley II Boots $240, A Baukjen Lexham Zip Coat $449” Finally the Grand Prize Package is of each of the Dailyprizes worth $3,811! Total ARV of all prizes in the holiday giveaway is $40,184! Enter the Ritz Holiday Parade Sweepstakes today and good luck! Visit this amazing Christmas 2013 giveaway and get inspired for the upcoming season, get recipe ideas or design a float! Ritz crackers are versatile and yummy and there are many amazing recipes for using them, perfect for the holiday season!